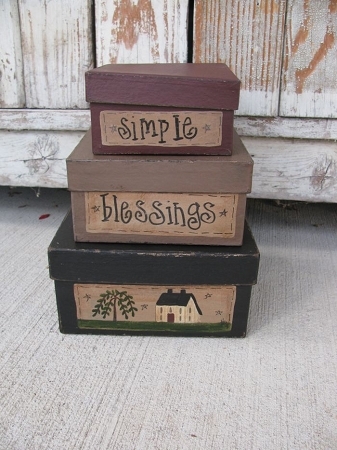 Primitive Small Saltbox House and Willow Square Set of 3 Stack Boxes with or with out Light. I used a smaller size of square paper mache stacking boxes to create this piece. 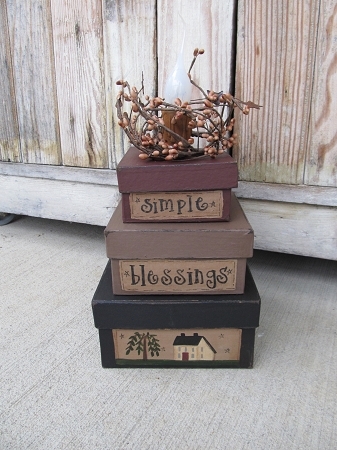 Design option is to have them as stacking boxes or to have a primitive candle light attached to the top box lid. Check out the options below. Saying shown is Simple Blessings. The boxes are painted black, burgundy and dark taupe (Mississippi Mud) Added to the top is a primitive candle lamp, that I've added a cinnamon treatment to, which comes with the silicone bulb. Nice long cord and on/off switch. Size as a light measures: 6"x6"x12" and without the light measures: 6"x6"x8". Hand painted and antiqued for a time worn look. Hand painted, designed and signed by Heidi. Please see second image for boxes shown with the electric candle lamp.